The Swedish-made Ankarsrum Original® has been revered for decades by cooks who want exceptional performance from their main kitchen machine. 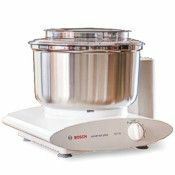 A great all purpose stand mixer, its strength also makes it a world class bread dough mixer and kneader. 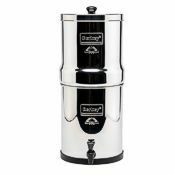 It's renowned for long term reliability and quality results whether you're making a cake, whipping a meringue, or preparing as many as seven loaves of scrumptious bread. This Ankarsrum is the older model N20, a standout machine with great capabilities. Newly designated the "Ankarsrum Original", the machines in this line have been known in the past as the Electrolux® Assistent, the Magic Mill DLX, and the Verona® Assistent. Name variations have been the result of changes in which U.S. company was serving as importer. The new Ankarsrum Original badge best reflects the origin of this outstanding machine, which has been built for over forty years by the Ankarsrum company in southern Sweden. The people of Ankarsrum take pride in producing a very special kitchen tool to the highest standard of quality. The Ankarsrum Original's clear, BPA-free whisk beater bowl will create beautiful meringues, beating up to 18 egg whites—or as few as one—with excellent results. You can also cream butter, margarine and shortening with sugar to the creamiest texture for all your cookie needs. When the clear bowl is used, it’s stationary (the stainless bowl turns during use), and the whisks drive from below via a center column in the bowl (the clear bowl is shaped something like a bundt cake pan.) This arrangement provides total access to the top of the Ankarsrum Original's bowl, with no overhead motor drive in the way. 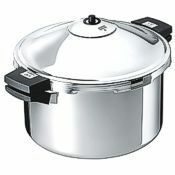 When mixing with either bowl, the only metal in contact with your food is food-grade stainless steel. 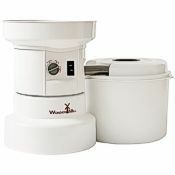 Using the stainless bowl, the Ankarsrum Original mixes and kneads smooth, silky, elastic dough quickly and easily with its unique roller and scraper design. This method effectively mimics kneading by hand, without the time and effort. As the stainless bowl revolves, the deeply fluted roller acts as your fingers, with the scraper mimicking the palm of your hand. The scraper folds the dough with a rhythmic motion while the roller provides a powerful massaging action. 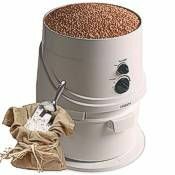 Your dough comes out smooth and elastic, in large or small batches. 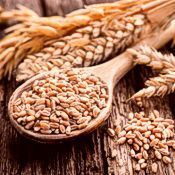 The biggest difference between dense, heavy baked goods and delightfully textured products is proper development of the gluten in the dough. 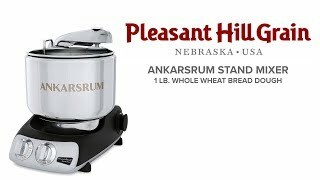 The large 7.5 quart stainless steel bowl of the Ankarsrum Original holds up to 18 cups (~5.3 lbs) of flour, enough to make approximately 10.75 pounds of bread dough, which will make five to seven loaves in 8" loaf pans. 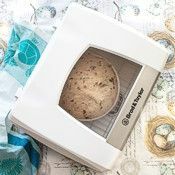 The efficient, high-torque 600 watt motor runs smoothly and quietly; coupled with an advanced transmission design, it provides ample power to mix and knead even the largest batch of heavy bread dough without straining. 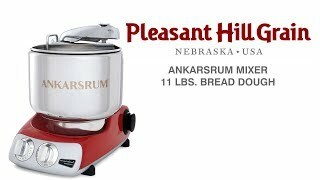 The Ankarsrum Original was nicknamed "The Workhorse Mixer" not by its maker but by users who praise this powerful kitchen helper that's so enjoyable to use. Any speed from 40 to 190 RPM can be selected, and an electronic speed sensor automatically adjusts motor torque to the load. A timer is standard equipment, so the Ankarsrum Original will do its work while you attend to other tasks. The control panel is angled for comfortable use, and the large timer and speed controls are attractive and easy to read. 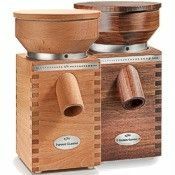 The Ankarsrum Original mixer measures 13.5"H x 10.5"W x 15.7"D and weighs 19 lbs. with stainless bowl. It sits firmly on solid rubber feet, and won't walk on the countertop during use. 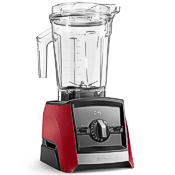 The shell of the mixer is made of strong cast metal, and is available in your choice of beautiful and durable finishes. The Ankarsrum Original mixer has a manufacturer's warranty covering the motor and drive train for five years, and all other parts for one year. 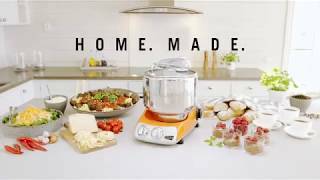 With a wide array of available accessories, the Ankarsrum adds a myriad of exciting dimensions to your cooking experience. On a gluten-free diet? Baking your own tailor-made recipes at home provides the variety, freshness and satisfaction that commercially prepared products can't match. Included with your Ankarsrum Original are the high capacity stainless steel bowl with cover, roller, scraper and dough hook, BPA-free beater-bowl with drive shaft and standard whips, hand spatula, and the new cake beater whisk. 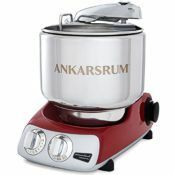 The Ankarsrum Original mixer is a lifetime investment in cooking enjoyment and superior results. 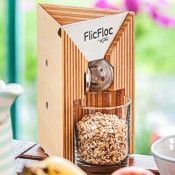 While it is a machine, like many owners you'll likely come to think of it more as your creative companion in the kitchen. Pleasant Hill Grain has, for years, been the largest U.S. Ankarsrum retailer. We use this exceptional machine regularly in our own kitchen at PHG, and we’re here as your resource whether you’re considering the Ankarsrum, have a question about your mixer, or are thinking of adding an attachment. We look forward to the opportunity to serve you! Sorry, we cannot ship Ankarsrum mixers to Canadian or other non-U.S. addresses.